When we found out we are having both a boy AND a girl, I was so excited. (I really hope Caroline is still a girl… hahaha, we go tomorrow for our first Level 2 ultrasound and that’s when they told me my little Brady was NOT a girl like they originally guessed…). By the way, we named the babies – did you hear? Caroline Sue and Tyler Joseph. We can’t keep secrets around here – so there they are in all their precious glory! Back to being excited… I started thinking about their nursery the other night and suddenly got really overwhelmed! My sweet girl can’t have her SUPER pink room because little Tyler will be in there. And vice-versa! So I knew I had to come up with something gender neutral-ish that was still really special. I adore Lindsay Letters (not to mention she’s a precious friend of ours) so I was perusing her shop looking at her canvases to find one that really spoke to me. I stopped in my track when I saw this canvas (#1 above) based on one of my favorite verses (that meant a great deal to me during our three years of infertility craziness). Brady’s nursery was “beach” themed because our roots are in Pensacola, Florida (where we’re both from and where Bryan and I met). 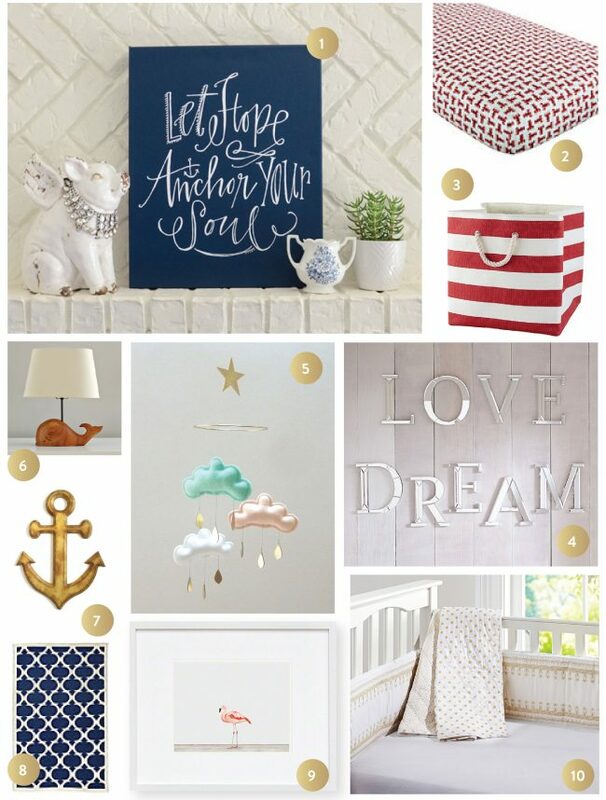 It only seemed fitting to design the babies’ room around a similar theme with more of a nautical / anchor feel to it.